Clean up your eating habits by avoiding foods highest in pesticides and more with Clean, Green, and Lean: Get Rid of the Toxins That Make You Fat. The author of this new and rather unique green dieting book is Dr. Walter Crinnion, a naturopathic physician and one of America’s foremost authorities on environmental medicine. 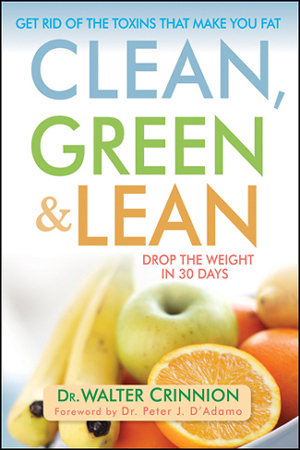 If you’d like to win a copy of Clean, Green, and Lean, leave a comment on this post before 11 pm CST on Friday, April 23, 2010. In your comment, please share what you’re doing in honor of Earth Day on April 22 or just say why you’re interested in this new diet book. The randomly selected winner must have a US address and respond to my request for a mailing address within three days. UPDATE 4/26: Congrats to the winner, Kerri R! sounds like what I need! LOse 30 pounds pretty fast? I’ll be planting my organic kitchen container garden this week for Earth Day. Helping granddaughter with her school project. Always looking for health tips. I have started juicing and I compost the residue. I would like to know of( new green ways) to improve my life. We’re planting a new palm tree in our back yard to honor Earth Day! I plan on going totally organic. I just had surgery a few weeks ago and I think this would be an awesome way to get all the toxins out o fmy system. I would love to try to eat clean. I’m scheduled to take dogs from a high kill rural shelter to transport/rescue groups in Columbus, OH. I would love to read this book. I have a friend working on this and I think that I would like to join her. We bought good bikes for everyone so that we could ride all over our small town instead of driving. I am always looking for ways to be better to the planet – this book would help. We will be getting our vegetable garden ready for planting! I’m interested in removing the toxins from my body. Losing weight would be a bonus. I planted a tree with my sons school yesterday, thanks! I’m interested in this new diet book. It sounds great. I am interested in this new diet book because I could always use more dieting tips.